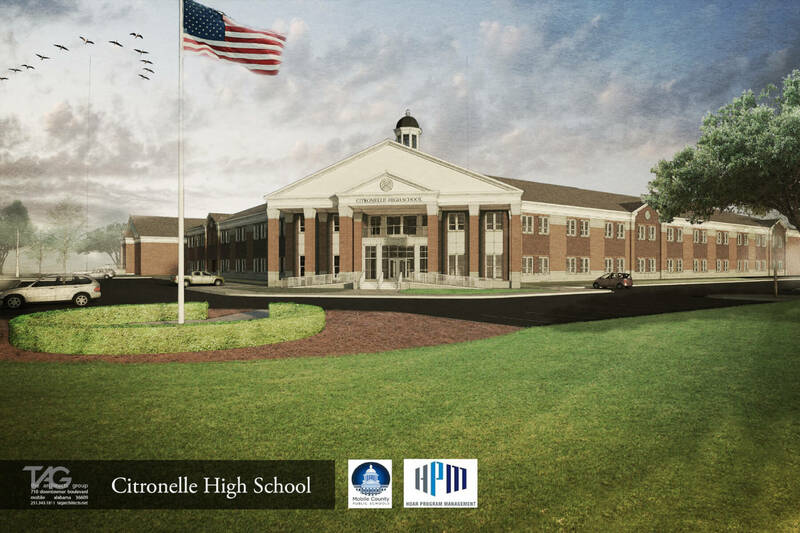 The Mobile County Public School System will break ground on the new $22 million Citronelle High School today at 10 a.m. The much-anticipated school will front U.S. 45 at Centre Street and is scheduled for completion in the summer of 2016, according to Rena Philips, supervisor of marketing and partnerships with the Mobile County school system. Rendering of the new Citronelle HIgh School. The new high school is one of several new schools MCPSS is building with a $100 million construction bond. The others include a new Fournier-Chastang Middle in Trinity Gardens; a new Mae Eanes Middle in Maysville; and major renovations to Barton Academy, Lott Middle, Dauphin Island Elementary, Burns Middle, Phillips Preparatory, Tanner Williams Elementary and LeFlore High. MCPSS is also doing $15 million worth of work to repair the tornado-damaged Murphy High and has opened several new schools over the last two years — Calcedeaver Elementary in northwest Mobile County this month, Augusta Evans Special School, Whitley Elementary in Prichard and Taylor-White Elementary in West Mobile.